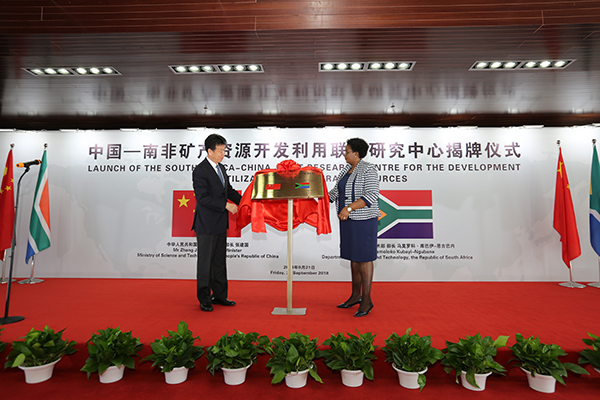 On 21 Sept 2018, Vice Minister Zhang Jianguo of Ministry of Science and Technology of China(MOST), and his counterpart, Minister Mmamoloko Kubayi-Ngubane of Department of Science and Technology of South Africa(DST), launched the Chinese node of the Joint Research Centre for the Development and Utilisation of Mineral Resources between South Africa and China(JRC) at BGRIMM R&D Center, Beijing, marking a milestone and a new starting point for international science & technology cooperation in mining industry between China and South Africa. Vice Minister Zhang Jianguo, Minister Kubayi-Ngubane and GM Han Long of BGRIMM Group gave their addresses respectively at the launch ceremony. Vice Minister Zhang Jianguo pointed out that, the launch of JRC is the strong echo to the consensus of the Presidents of China and SA to promote China-Africa cooperation Initiatives and the Belt and Road Initiative. He urged an active engagement of BGRIMM Group and his South African counterparts of JRC to achieve high level research outcomes,foster more talents with professional and international perspective and set up a new benchmark for the international science and technology cooperation. Minister Kubayi-Ngubane said that, new technologies that maximise beneficiation of mineral resources while reducing environmental damage will benefit industries in both South Africa and China. The cooperation provides an opportunity for both countries to supply new cutting-edge technologies to other countries. The JRC represents the next logical step in advancing a research collaboration that was established between the parties in 2014 and which has benefited both countries. South Africa is privileged to be able to work with a prestigious partner such as BGRIMM in this crucial domain and the overall political, economic and development partnership between both countries would be significantly strengthened. Following Kubayi-Ngubane’s address, GM Han long said that, this momentous occasion demonstrates the importance the two countries attach to science & technology cooperation and represents an important milestone in the further strengthening of cooperation in science, technology and innovation between South Africa and China. Since establishment of the Center with funding from MOSTand DST, BGRIMM Group has been maintaining active communication and close cooperation with the parnters including Mintek, UCT, UL and CSIR, to outline the implementation plan, determine development goals and operational mechanism, and clarify common research areas and work priorities for the JRC. In future, adhering to the principles of "equality, mutual benefits, complementary advantages, joint construction, win-win goals, and open cooperation" through active innovation and close cooperation, the Center will enhance acdemic and people exchanges in fileds of mining, mineral processing, environmental protection and energy materials to jointly promote R&D outcome transfer, paving the way for win-win development of scientific and technological innovation and cooperation in mining industry of China and SA. The launch ceremony of the South African node of the Joint Research Centre (JRC) was held on 14 Sept. 2018 at Mintek, South Africa, during which, the officers from the two countries were present, including Vice Minister Xu Nanping of MOST, Mr Li Song, Chargé de Affairs of the Chinese Embassy in South Africa, Dr Phil Mjwara, Director-General of Science and Technology, SouthAfrica, and Ambassador Dr Manelisi Genge, Chief Director: Asia and Middle East at the Department of International Relations and Cooperation, South Africa.